Rare: Really, the only way to eat steak. I eat it so rare, the steak sometimes tries to talk me out of eating it. So rare that, if I offered a five second head start, it would take it. I mean so rare that it is still capable of reproducing. I could go on. Well-done: If you aren’t sure you are eating beef, this is probably the best route. If you ARE sure it is beef, then you are a monster. 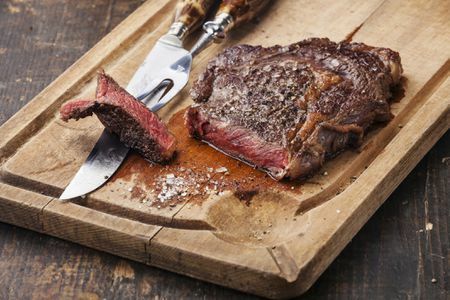 Cut into Strips: Think of the well-used term, “a juicy steak”. Now, imagine the most important adjective of that phrase nullified by cutting the meat into shoelace-sized bits of leather. With Ketchup: A good indicator that you are going to Hell. Surf and Turf: You’d think pairing a steak with a large aquatic insect would be a bad thing; but, you’d be wrong. Plus, if the steak isn’t high quality, you’ve got enough melted butter at the table to make a monopoly board taste good. Grilled: Excellent for those times when only a piece of meat ruined by a fat suburban guy in a novelty apron will do. does anyone actually eat it cut into strips? will it be still called steak? They DO and it’s a travesty of an atrocity of a bad thing. You are definitely the opposite of a steak lover, Deb. Now, steak and kidney pie is great. Medium rare filet please. A ribeye in a pinch… any lower grade and you might as well eat hamburger. I like a big fatty sirloin. I made a great fried rice with filet mignon, once. It was emergency fried rice. Medium Rare. And the only time I was really mad at France was in the nineties when they decided to detonate those underwater nukes. Yeah, but they love Jerry Lewis, so what’re ya gonna do? And they invented the Metric System! There’s always one… But, let me say: Well done! …we had skillet steak yesterday because of the snow. The whole house smells like seared steak and I’m not complaining.